The Roux-en-Y, RUNY, or RNY is a more complex operation, which evolved from the VBG to provide more consistent and successful weight loss. The small upper pouch (1/2 ounce) is completely separated from the distal stomach which is left in place. 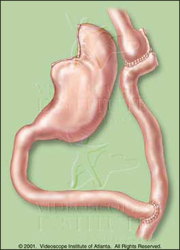 A “Y” shaped segment of small bowel is attached to the pouch with a narrow opening. This delays the mixing of food and digestive juices from the distal stomach resulting in poorer absorption of calories and nutrients. This both restricts food intake and interferes with absorption resulting in more consistent weight loss, but has a higher risk of complications or side effects. 80% of patients lose at least half their excess weight with the RNY procedure. The RNY averages a 2-day hospitalization with a return to full activity in 7-10 days. A liquid protein and soft diet is suggested for 6 weeks post op.